While no building is truly fireproof, construction materials and systems can make a building safer. Fire-resistive construction gives time to discover a fire, suppress it before it spreads and evacuate the building, if necessary. In many cases, ordinary wood-frame construction with plywood or other wood structural panel sheathing provides ample fire safety and is completely acceptable. Other materials may require additional protection. 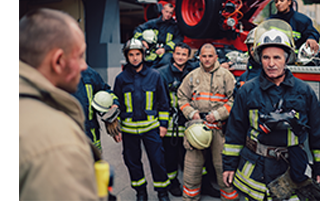 The engineered wood products industry, working with code authorities, is committed to continuous improvement of fire safety for the protection of homeowners and fire service personnel. As construction evolves, incorporating new building materials and techniques, the engineered wood industry continues work to address concerns about fire safety, including for engineered wood I-joists. I-joists are used in about 50 percent of framed floors in single-family homes in the U.S. There are several reasons for the growing prevalence of I-joists in floor construction. They provide consistent performance, reducing the cost of callbacks for squeaks and bouncy floors. They are readily available and easy to install, especially for long spans in open floor plans, and there are many choices for I-joist floor assemblies that comply with International Residential Code (IRC) requirements, which gives builders flexibility. For the safety of occupants and firefighters, the IRC includes provisions to enhance the fire performance of floor systems. For example, the IRC requires that all residential floor assemblies be covered with gypsum board or have some other means of fire protection. There are several code-compliant alternatives for design and construction of fire-protective I-joist floor systems, but most builders find it easiest to use gypsum board or an automatic sprinkler system. Drywall, or gypsum board, the most common interior finish used in the U.S., is made of fire-resistant materials. Gypsum is a naturally occurring mineral, calcium sulfate dihydrate, and about 1/5 of gypsum is chemically combined water. Gypsum board is noncombustible; when exposed to fire, its inflammable core slowly releases its stored water as steam, which slows heat transfer through the board. Even after all the available water has evaporated, gypsum board remains an effective barrier to heat transfer. Presented by Robert Neale of Integra Code Consultants, former vice president of National Fire Service Activities for the International Code Council, this training focuses on assemblies that meet the fire-protective membrane requirements of the code, specifically as they relate to I-joist floor systems. This information is presented in the context of what firefighters, fire officials and code officials should know about code requirements and tested alternatives to ensure requisite structural performance in fire conditions. This course is approved by AIA (1 HSW/LU) and ICC (0.10 CEU). Note: Do not navigate to YouTube if you require a certificate. A downloadable certificate of completion is available only when this webinar is viewed on this webpage in entirety, after completing a brief questionnaire. 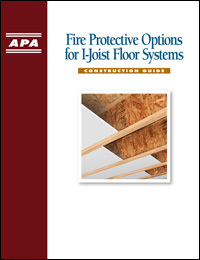 Fire Protective Options for I-Joist Floor Systems describes several options that satisfy fire-protective membrane requirements of the 2012 and 2015 International Residential Code (IRC). These options include gypsum board installed on top of the bottom flanges, gypsum board ceiling membranes, gypsum board applied directly to I-joist flanges and webs, ceramic fiber blanket, mineral wool insulation and fire protective coatings.